Puerto Rico is not well known for its Heavy Metal. However, Dantesco will soon become the ultimate exception to the rule. Whilst on stage, their ecclesiastical costumes and energetic performance have already garnered comparisons to Candlemass or Mercyful Fate yet that fails to capture the breadth of their sound. 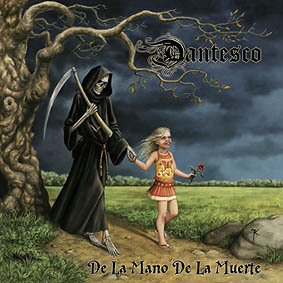 On the whole, they play blistering Heavy Metal with dashes of Doom and charged operatic vocals sung wholly in the Spanish tongue, and by my reckoning that makes the band a unique beast. They have one foot standing proud in the ‘80s tradition, without sounding remotely dated, and the other in the present, both of which shine through on their debut full-length album. After a moody introduction, the lengthy“La Tempestad” reveals the darker and doomier dimension of their music whereas “Cronicas De La Muerte Negra” and “Morir De Pie” are sharp, driving, melodic anthems in the classic vein. The gifted musicians rip through a whopping ten songs in all. The emphasis shifts by subtle means between the darker and traditional spheres guided by Erico Morales’ bounding voice. “Ataca La Bestia” is a grand example of where they collide head on. Without a doubt, the calibre is consistently high and their conviction genuine. By rights, the band should be welcomed into the hearts of a broad range of fans provided that nobody is that narrow-minded to be put off by the foreign language. Heavy Metal! What do you want?